Shop for Maui condos for sale that are ground floor, first floor or level one units. There are many reasons why you could want a first floor apartment at a condominium. Some ground level condos include a larger lanai or maybe even a yard you could use to garden or exercise a pet or provide a place to play. The extra space on a patio or in a yard gives you additional space to live and entertain in Maui’s mild climate or can be used to store bulky items. Maybe you are older, have bad knees or other medical conditions or disabilities, then a ground level condo maybe on your wish list. If you don’t like the hassle of waiting for elevators or want a stair-free lifestyle then a first floor condominium could be for you. Sometimes you can find ground floor homes with patio doors exiting to common areas with a pool and take a swim just steps from your condo. If you have a lot of groceries or are moving furniture you will want a ground floor unit. 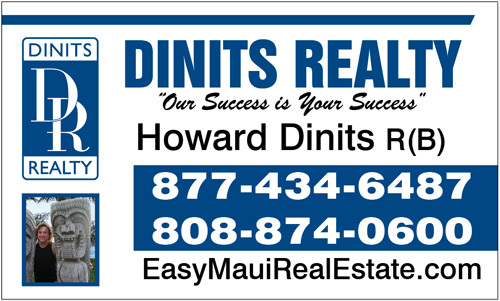 Our Market is heating up so when you have found the home you want to buy be sure to call Howard Dinits R(B) at Dinits Realty 808-874-0600 to put your offer in right away. Want to see what is for Sale on the ground floor? Click Here to see First Floor Condos For Sale.